Whenever it comes to hear about hashtags, for most of us it’s not quite clear what is the main purpose of using them and what benefits it can offer for us. In this post, I will emphasise the importance of using hashtags whenever you post something on your social media profiles. Moreover, I’ll guide you through the main marketing tools assisting you in using your hashtags wisely as well as to get a more in-depth look into usage data around a particular hashtag of your choice or the ones relevant to your topic. Why you need it after all? Honestly, the reason I’m covering this topic is pretty obvious. I myself haven’t been using hashtags at all until I went through a research and started to use it as for testing purposes. The result, much higher engagements from my followers and non-followers alike. Adopting use of hashtags could mean the difference between reaching thousands of potential users or a minority of people. Now, I suppose some of you are wondering why your audience engagement is so low despite the high frequency of postings you might do on a daily basis. By using hashtags, your message can be found much easier by users, it is used both to organise messages by topics, brands or events and last but not least to create conversations around these topics. In addition, there are other methods of use, simply for fun or to get your audience a little bit amused, examples like #feelinglucky or #whataday. In case of events, it is very often used for tracking performance of promotions. Also known as labeling, by simply using them, you can organically attract the attention of thought leaders or influencers within your industry or topic. According to research done by Twitter, by simply adopting the use of hashtags, results in twice as many engagements which makes many of us reconsider how we spread our words through social media channels. On which social media platform would it be worthwhile using it? As you might have guessed, Twitter leads the list when it comes to the benefits of using hashtags then the list continues with other popular social media platforms like Tumblr, G+, Facebook, Pinterest and Instagram. And yes, you might ask why I didn’t include LinkedIn. The truth about LinkedIn is that they implemented it under the name LinkedIn Signal which proved to be unsuccessful and later being withdrawn. 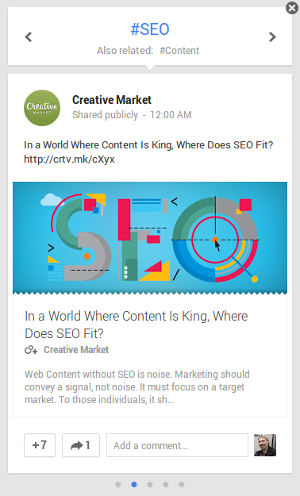 In case of G+, what you need to know is that hashtags are being added automatically and by clicking on these hashtags you are activating a flipping post card which lists other posts under the same hashtag. You will also get relevant hashtags under the main one which you can also be considering to use or simply use it as a navigation method in search of relevant posts. It’s indisputable the numerous benefits hashtags could offer for us, still you should be careful how you use them. I’ve gathered the most popular mistakes users make, mistakes you must avoid otherwise you could easily have to face negative consequences. 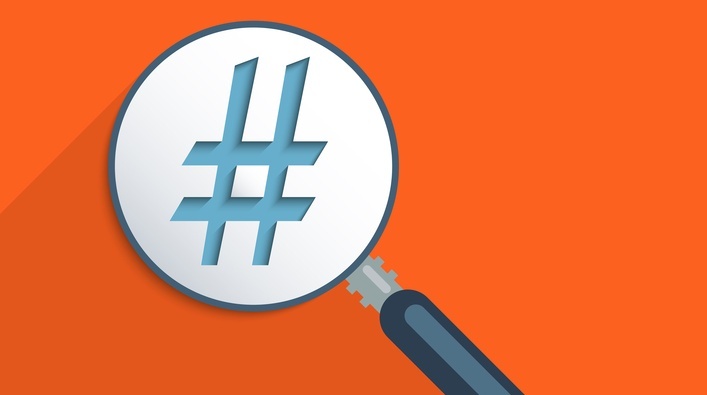 Now, it’s time to get ahead with your use of hashtags the way professionals do. And yes, any professional just like me, we are using several tools to accelerate and to reach better performance with our social media activities. There is no need to use all of the following tools but I gathered the most prestigious ones so that you can easily pick up the ones which you find more comfortable and efficient to use. Play around with them, let all of us know about your experience lower in the comment section. I have already mentioned this tool in the “Your Ultimate Competitive Benchmark and Analysis” as an alternative for Google Alerts. However, TalkWalker has much more to offer especially in terms of professional social media management. There are many tools available on the market, but TalkWalker proves to be a winner when it comes to detailed brand or topic analysis. By simply entering your desired brand or term (in our case, your hashtag), in an instant you’ll get a visually easy to interpret dashboard on which you can further investigate all the data available from media types to demographics and from performance to influencers. Below you can see a snippet of all the data this tool will offer you. You’d better try it for yourself, no regrets or waste of time, I promise. This tool proves to be useful when it comes to hashtag optimisation, to visually see your hashtag’s potential reach (I’m myself using their browser Chrome extension but it’s available for FireFox and Safari as well, you can check out here). You can setup email alerts based on your topic and get notified of trending hashtags within your niche. This could help you in your content marketing strategy. What I also found useful was the hashtag directory they provide with filtering options. 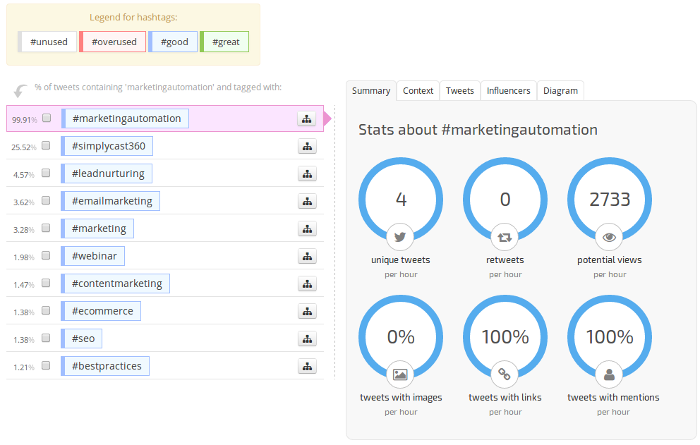 Below I have embedded an interactive infographic I generated with this tool for the #marketingautomation hashtag. On the main dashboard, you’ll get a timeline with all your tweets as well as statistical data in terms of reach (tweets with no chance, low chance and high chance of being discovered). Poorly performing tweets can be easily re-edited and optimised for a reschedule posting. This tool offers you a quick way to have a look on latest conversations around a certain hashtag detected on major social networks. 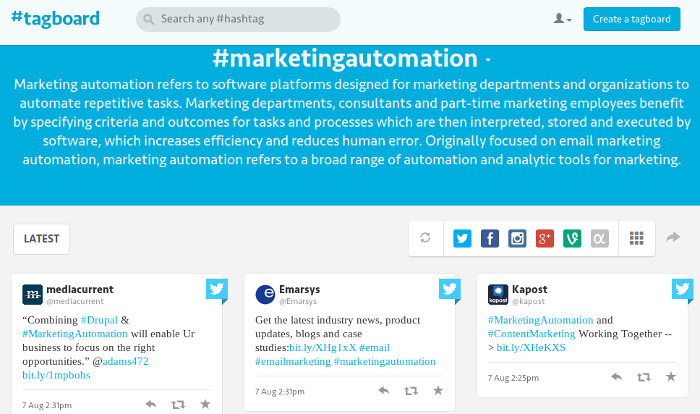 You can create your own tagboards around most used hashtags relevant to your topics. You can disable those networks you are not interested in and leave only those you need to make further investigations. What I noticed with this tool was that you could easily spot related hashtags, in case of marketing automation there would be #emailmarketing and #contentmarketing. There is also a TagBoard Pro version for even more advanced customisations and statistics. At first glance, this tool did not attract any serious attention from my side, still, as soon as I registered and activated the free version which means it analysis a maximum of 2,000 tweets in a certain topic, the tool itself proved to be a visually matchless source of statistical data. You can search either by term or hashtag of your topic. You might get confused with the tool’s navigation but playing a little bit around with it, you will find it pretty comfortable. Make sure you don’t confuse control panel with the one level lower dashboard section. The most value this tool offered me while doing my research for #marketingautomation was the contributors rankings report (see below). Another useful report would be the activity report throughout an adjustable period of time. Frankly, I personally don’t like the feel and look of this website 🙁 but thanks to its popularity when it comes to advanced hashtag tracking and analysis, it still worth mentioning. In order to get the full potential of this tool, looks like you must apply for one of the four paid hashtag analytics packages available. Only after watching through their product introductory videos, realised the full potential this tool might offer you. I’d better share with you these videos right in my post and let you decide if you’ll add it to your arsenal of marketing tools either your role being a blogger, event organiser, publisher or agency. In my opinion, the Tr team are doing a great job, nice looking and awesome charts for reporting, data export capabilities in CSV or PDF format, all in one place. In case you are considering having a real time and comprehensive monitoring and measurement of twitter behaviour to understand and maximise your social impact on your Twitter campaigns, the Tr tool could be the right choice for your needs whether you are a marketer or agency. Good news for small to medium sized companies or individual bloggers like me, is that it has a one-time purchase pro package as a snapshot report. 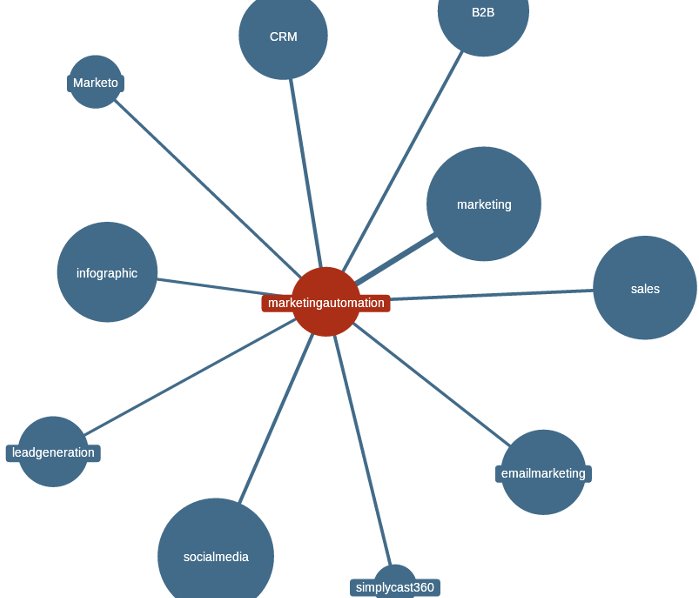 This is the free version of the much robust hashtag intelligence analyser CyBranding tool. But as for now, let’s remain at hashtagify.me and see what it has to offer for us. You will find three main sections in the top navigation menu, the first shows you in an instant the most related hashtags to the one you are analysing. The second item lists the top six influencers for your hashtag. And the third navigation item leads you to the usage pattern for the last two months. Though in order to leverage the full potential of this tool and have some actionable insight data, you might be considering the pro version branded as CyBranding. This tool allows you to register a hashtag of your own after which you’ll get a brandable landing page. This is great for events, twitter chats to send it as a landing page or sort of tagboard page with livestream tweets. Basically one of the most prominent features of this tool is the Twitter chat and live event tools about which I’d rather recommend watching through the following YouTube video. If you have watched through the video, you could also get informed about the searchable and categorised directory which offers an easy way to find and join the tweet chat of your interest. Another great tool I found while doing my research. What I really like about this tool is its dashboard style layout, offering you a bunch of data on a single page though you really need a premium package to get the full potential this tool can offer you. This tool seems to be focusing on visual map data allowing you to easily spot your analysed hashtags by their use on different geographical locations worldwide. 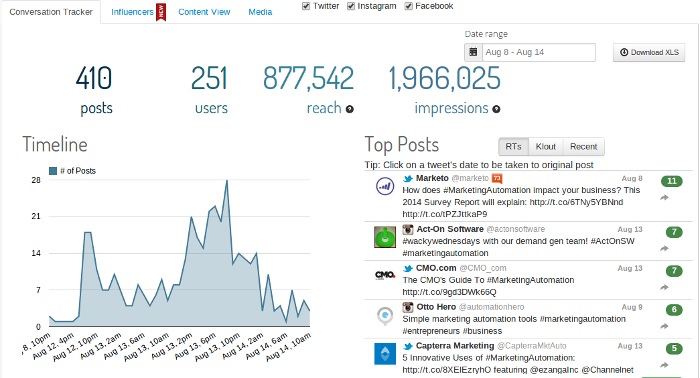 This tool offers historic as well as real time insights into any hashtag you want to get a more in depth insight. The tool itself offers a detailed overview of any of the hashtags of your choice equipped with an easy to use reporting platform over your data. In the overview of the Analytics dashboard, you’ll get a wealth of information about the investigated hashtag, information like activity timeline, platform distribution on which tweets were being sent, engagement distribution, top sources of content as well as relevant other top hashtags. 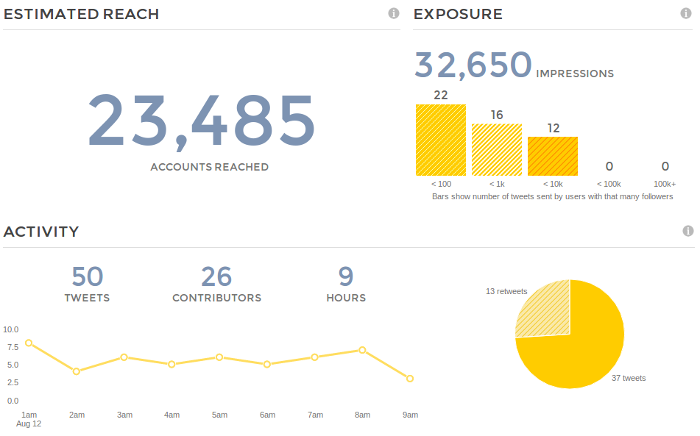 What I really liked about this tool was the instant access to the potential reach you can achieve with your hashtag as well as number of contributors. In addition, the tool allows you to create a report of your own. This could be valuable when you need separate reports based on different time intervals within a timeframe of the last three months. Also, when it comes to a well coordinated teamwork, Hashtracking is equipped with such a functionality, this feature is more than welcome for small and mid-sized agencies. A free tool pretty similar to a search engine listing with some additional insights on the left sidebar. You can fine tune your search by selecting the media (blogs, images, questions) as well as use its advanced search functionality, which helps you in conducting your research on a more granular level. Data can also be downloaded in CSV format for further analysis and reporting. Brought to you by Internet Media Labs, a technology company developing powerful social media tools to better manage, analyse and engage with your audience. This tool is similar to Socialmention and Twubs, also covered in my post. These kind of tools offer you a stream of tweets around a certain hashtag of your choice. This way, you can easily engage in a twitter chat around your hashtag topic. It’s hard to say which one would better suit for your needs, even I could not decide on this matter. I leave you to experience it for yourself and pick the one you find more user friendly and beneficial to meet your goals. It’s a hashtracking software which has a major advantage against the other tools listed in my post which is that besides hashtags used with Twitter, this tool allows you to track hashtags used in Facebook and Instagram. If you are looking for a professional real time tracker, Keyhole would be the right choice. A strong incentive trying this tool would be the real big names who are already using it like HuffPost, MTV and Ogilvy just to mention a few. In the attached image, there is only a fraction of the whole list of useful data this tool offers you among which the most prominent would be top websites/domains mentioned in posts, most influential users, origin of posts (interactive map), demographics data, top sources and many more. 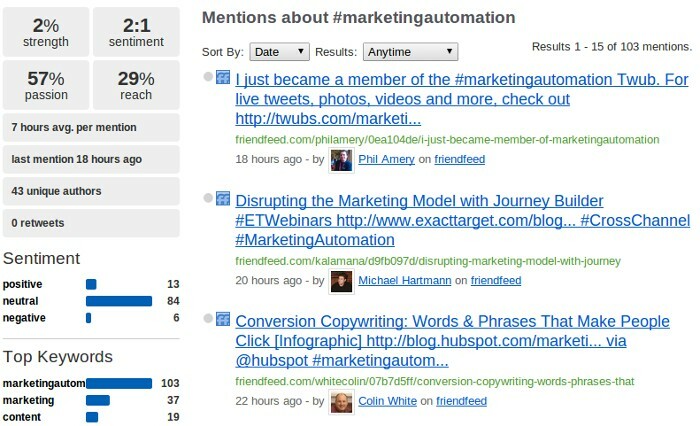 Very similar to Socialmentions with a SERP look and feel. 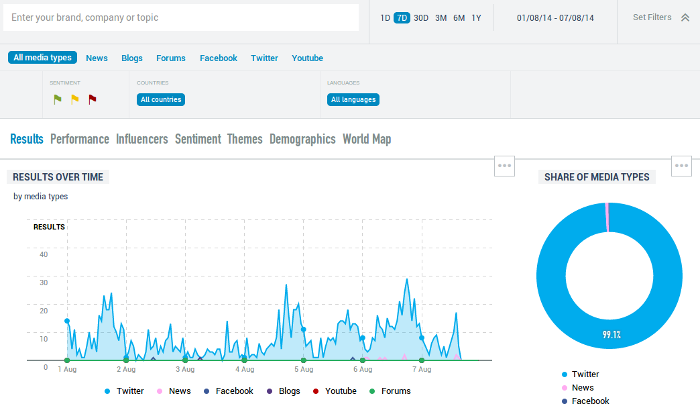 You can further filter the list by time period, tweets, links, photos or videos as well as influencers and language. Still, despite its relevancy with the Socialmention tool, Topsy used to offer you a quick way to compare three hashtags in terms of their use within last thirty days. Regardless of the type of website you are running or the business industry you are being active online, social media is part of the game and by proper use of hashtags you will experience a much higher level of reach and engagement. Probably I listed more tools than you might need to reach your ultimate goals, still I leave it up to you in deciding which one would better suit for your needs. In my case, the tools I’m already using are RiteTag (chrome extension), Talkwalker, TweetBinder, Topsy and Hashtracking but Keyhole and Twitonomy would also be a good choice. Now I’m curious what tools you are using and what results you got? Let’s exchange our experience and discover even more opportunities either by sharing your own strategies or other similar tools not listed in my post. Or, we’d better ask, why is the power of hashtags so hot? It’s called Hashtags, hashtags: The Tonight Show Starring Jimmy Fallon. Watch and get a bit amused :).